Here’s a woman who only identified herself to Montana Public Radio as “Rainbow”. “Rainbow” is no fan of President Trump. “He’s a misogynistic, bigoted imbecile," she said. 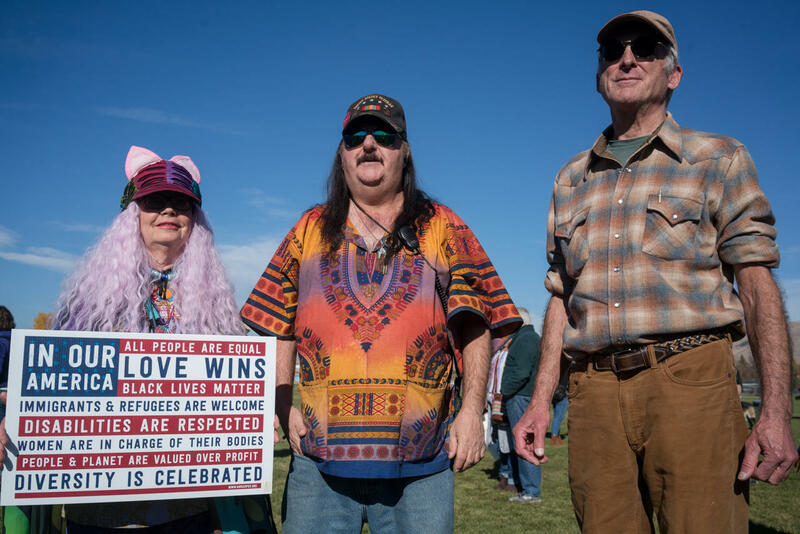 'Rainbow' (L), and friends at Missoula's 'Love Trumps Hate' rally, Oct. 18, 2018. The group that organized the event at Playfair Park, Missoula Rises, said it wanted to create something constructive. The group provided participants free bus rides to the county election headquarters about a mile away at the fairgrounds. There they could register to vote or drop off ballots. Petitions and political informational booths were everywhere. Kelli Twoteeth staffed one such table. “Just being here – being at rallies, being present – it gives us that visibility. 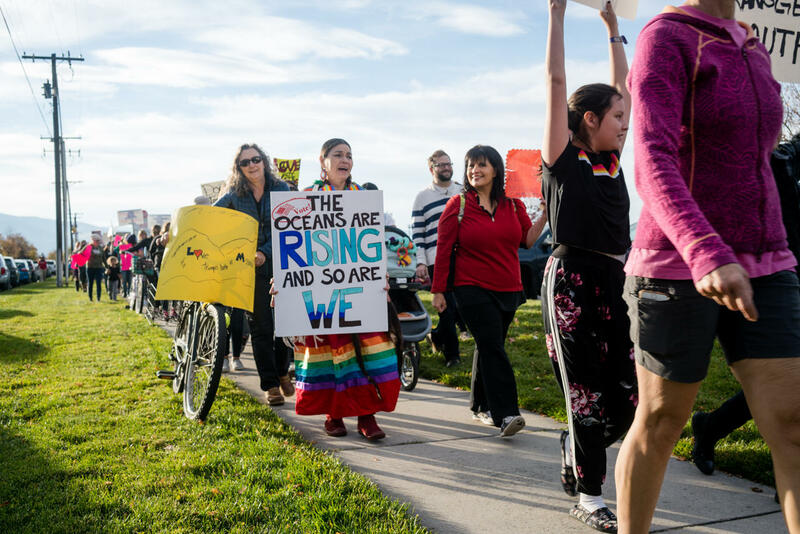 It shows we’re still here and still fighting within our state, alongside all other people in trying to bring light to the issues that affect Indian Country," she said. 'Love Trumps Hate' rally-goers in Missoula march to the polls, Oct. 18. 2018. Her top issue right now: Missing and murdered indigenous women. She describes it as an epidemic. Jenny Gorsegner’s top issue this – and all elections – is healthcare. Gorsegner’s 4-year-old twins, Abby and Henry, were having a blast playing in the park’s sandy volleyball pits. Gorsegner says Henry needs intensive therapy five days a week. She believes Democrats have her family’s bests interests in mind. Missoula’s Virginia Avery came to the Love Trumps Hate rally dressed as a Halloween witch. For all the passion on display at Thursday’s “Love Trumps Hate” rally in Missoula, there was no violence. Mike Boxell said America’s right wing creates enough rancor and incivility. Boxell wants the left to stay above the fray and was glad the rally didn’t turn ugly. “If somebody wants to start an action – block traffic and all that – then they’re bringing themselves down to down to their level, plus they’re filling into a self-fulfilling prophesy," Boxell said. 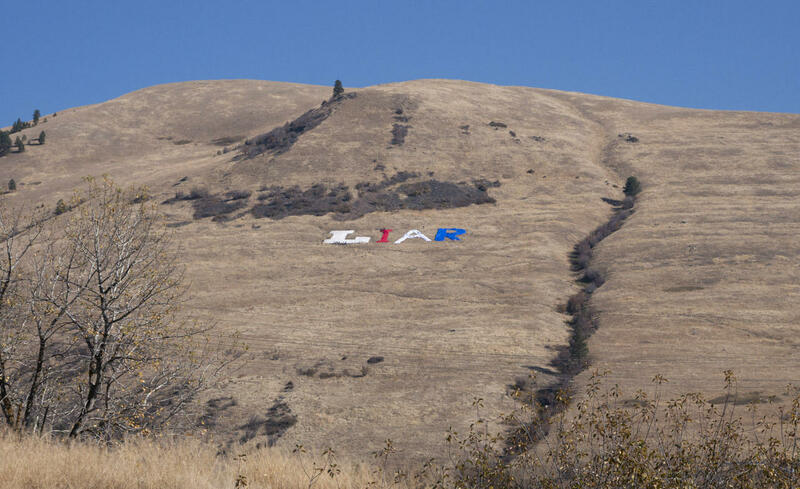 Boxell then pointed to the word “LIAR” which someone had spelled out with giant banners on Mount Jumbo overlooking Missoula. “Action like “Liar” (written up there) - I don’t know if you see ‘liar’ up there- that is a quiet, non-violent assertive action. I’m all for that,” he said. A message on Missoula's MT Jumbo before President Trump arrived for a campaign rally, Oct. 18. 2018. Several members of the "General Defense Committee for the International Workers of the World Missoula Chapter," otherwise known as ANTIFA, joined the rally and had a small informational table. Several were dressed in dark clothes and carried black and red flags. They caused no problems. 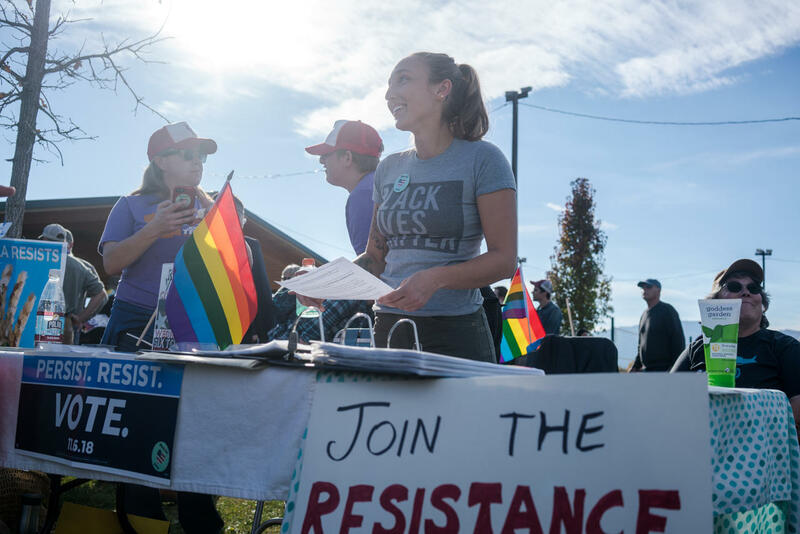 Sierra McMurry registers voters during a 'Love Trumps Hate' rally in Missoula, Oct. 18. 2018.